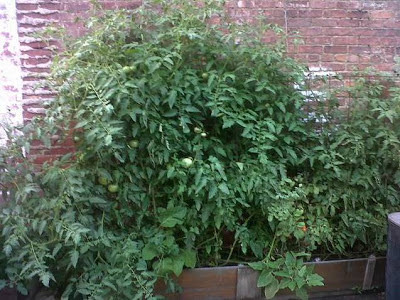 Tomatoes growing over 7' tall in 2012! I have had a lot of amazing success growing tomatoes the last two years. And I am convinced that in part, that success is owed to the hole. My pretty tomato plants- all started from seed- just before planting. Tomatoes are different than other plants. Any part of the plant that is below the soil line will develop roots. So it ultimately benefits you to bury your plants DEEP! I know it seems backwards because you want that plant to be as big as possible, as soon as possible. But trust me that burying your plants DEEP means that they will develop really strong root systems. That's the best possible scenario! It not only supports the big plant and fruit, but it means the plant has a greater system to send energy into producing the desired fruit! But when you dig your hole, dig it even deeper! Because you need to add some special ingredients into the hole before you add the actual plant. You need to add your trash! Starting each spring, I start saving my trash in my freezer. In zip top baggies, I save used coffee grounds (including the liners as they are fine to add to compost), banana peels and egg shells. Each time I make coffee, eat a banana or use eggs, I add the trash into my freezer bags in anticipation of spring. And I do this even if I have a compost going! I specifically want these three ingredients to add to my tomato plant holes. Once the DEEP hole is dug, I drop in some coffee grounds, banana peels and egg shells. I also add a bit of Azomite and Epsom Salts. Then sprinkle a bit of dirt back on top- just a bit though. Then I plant my tomatoes as deep as the now trash filled hole will allow. Deep Hole. Much deeper than you think you should dig. Add some banana peels, egg shells and used coffee grounds. Mmmm! Top with a dash of Epsom Salts and Rock Dust/Azomite. Everything but the kitchen sink! Then sprinkle a bit of dirt on top and place your plant on top of that. Cover with dirt, taking care to create a little well around the plant to catch water. The coffee grounds add some acidity to the soil. The banana peels add potassium. And the egg shells add calcium, which helps prevent blossom end rot. And as they rot, they all add nitrogen. Not only do tomatoes crave all three of those things, but so do worms. And worms are gold star garden helpers! Look how much smaller the tomatoes are after planting. They are DEEP! You can certainly buy chemical fertilizers. But why? I mean, they are full of chemicals. Even the organic ones are super questionable. And this method is free. I simply save what I would normally throw away. Oh and if you don't make coffee, I've read that even big chains like Starbucks gladly give away used grounds to gardeners who politely ask. This method is so great for my tomatoes this year, the worms all year long and eventually, the soil as it breaks down into a rich compost over time. So something else will grow big and wonderful in this spot next year! This is the ultimate trash to treasure project! 15 tomato plants just after being planted. Grow babies, grow! Why thanks for the great tutorial. Now how do I keep the chipmunks away?